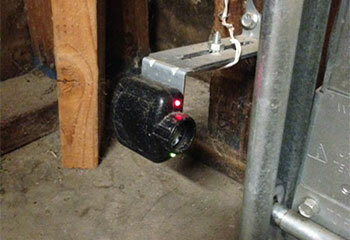 Are you having a problem with your remote control, your opener, or any other part of your automatic garage door system? Our repair specialists can fix anything. Take a look at the latest projects we completed to learn what we can do for you today. Customer Issue: The customer’s overhead door would only open partway, leaving the car unable to exit. Our Solution: Since there were no physical jams to be found, and the door didn’t have any problem closing again, the team reset the opener to factory settings and recalibrated the limit and travel limit values until the garage door could rise all the way to the ceiling without issue. 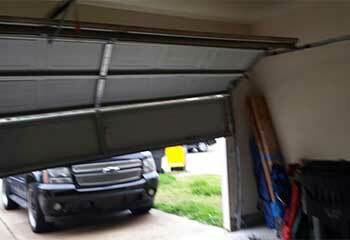 Customer Issue: Garage door got stuck open. Our Solution: We quickly found evidence of damage to both the tracks and the rollers. We began by fixing the bent sections, and then replaced the broken nylon rollers with new and more durable steel units. After lubricating them, we tried the door again and it opened and closed smoothly. Customer Issue: Misaligned photoelectric eyes. Our Solution: The opener safety sensors somehow got out of alignment, and that was causing the opener to mistakenly "think" there was something blocking the door. After we realigned the sensors, the door could once again close without any issues. 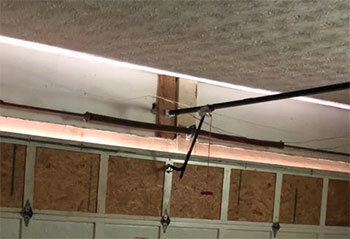 Customer Issue: Garage door extension springs broke. 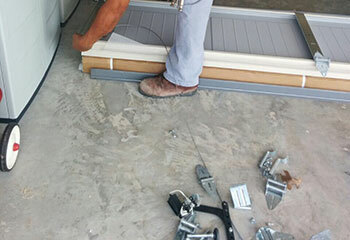 Our Solution: Before removing the damaged components, we first made sure the lift cables and the door panels weren't damaged in the accident. Then we proceeded to install new springs in place of the broken ones and secure them with safety cables that would help keep them in place.